When you need geotechnical or materials testing conducted for your project, how important is it to you if the laboratory is certified? And, is it important who verifies that data? While in the depths of a construction project, you may not be focused on plaques on a wall or initials behind a name when it comes to relying on quality, reliable test data, but those credentials can make or break your project. You may be surprised at the number of checks and balances used to verify the quality of Terracon’s laboratory and field data. Laboratory certification is a means of determining technical competence, ultimately providing clients with peace of mind knowing Terracon is qualified to produce accurate, reliable, and repeatable test data. subsurface, confirm construction quality, and facilitate building construction with confidence. The CMEC and “other” certifications in the chart above are utilized for specialty tests. AASHTO and USACE accreditation are the two more common certifications that we will cover in more detail below. The AASHTO Accreditation Program (AAP) is the largest form of accreditation to recognize the competency of testing. Many of Terracon’s specialty laboratories participate in AAP’s voluntary program, satisfying the requirements of AASHTO R18, ASTM E329, ASTM C1077, ASTM D3740, ASTM D3666, and others. This group of quality standards contains criteria for establishing and implementing a quality management system (QMS). The QMS is comprised of organizational structure, staff responsibilities, policies, standard operating procedures, processes, and records required for the laboratory to meet stated quality objectives. The AAP utilizes laboratory assessments and proficiency sample services provided by the AASHTO Materials Reference Laboratory (AMRL) and the Cement and Concrete Reference Laboratory (CCRL). The AAP inspection process is a comprehensive and stringent process which includes review of quality management systems, personnel training, equipment calibrations, specific test procedures, and standard reporting requirements. The U.S. Army Corps of Engineers’ Materials Testing Center (MTC) conducts inspection services to validate commercial laboratories conducting materials testing services for the Corps of Engineers. Many of Terracon’s labs are currently validated by the USACE to perform testing related to concrete, soils, asphalt, and aggregates routinely. 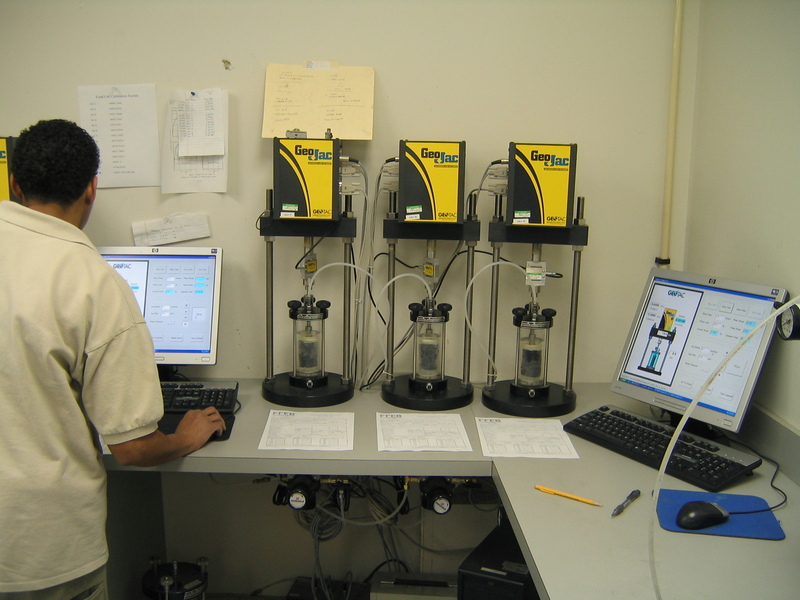 These materials testing services are provided for a wide array of projects. Similar to the AAP, the MTC has specific requirements which must be met and confirmed before validation is granted and the facility is permitted to perform project-specific materials testing. Compliance with the various standards of public agencies and certifying agencies is critical to our profession. Compliance validates the technical competency of our laboratories and quality of our work, thus ensuring proper equipment calibration and maintenance, technical competence of staff and proper report preparation. Perhaps the most comprehensive laboratory validation program comes from our internal standards. Because Terracon must render professional opinions based upon test results generated by these laboratories, we have developed a national program to validate the quality of the data. As a part of our internal quality protocols, we audit our own laboratories annually and maintain a team of more than a dozen internal auditors dedicated and trained using our quality management program system. Although our audit covers the requirements of the various agencies, our internal program goes above and beyond the boundaries of these agencies. Two Terracon specific provisions we address are safety and timeliness of delivery. Our laboratory data must be generated using safe work practices,and the data should be delivered on time and in a consistent manner. Terracon has consistently provided a comprehensive range of laboratory services related to the construction industry for more than 50 years. By combining our national resources with the unique, local area expertise of more than 130 offices, Terracon provides services for thousands of projects each year. We specialize in the sub-fields of soils, concrete, asphalt, aggregates, rock, and a wide array of other construction materials. We deploy the resources of a network of more than 3,500 employees and 120 quality-driven laboratories to work for you.